The spiral made in my lawn this year has been thoroughly enjoyed by many – children always run around spirals – turning, turning, turning, always turning, always running, always laughing – it is a delight! Easy to do – you cut the lawn on a high setting and then starting in the middle, mow outwards on a lower setting, keeping a gap of the mower width to your right or left, whichever way you are moving. I’d love to know if you give it a go. What pattern would you create? I saw this on a site called ‘Trust Me I’m a Designer’. Clever don’t you think! and the One – a – Week Photo Challenge that Cathy and I have compiled for fun. This entry was posted in art from natural objects, garden, haiku, Haiku Challenge, land art, Photo Challenge and tagged art in the garden, grass art, grass spiral, haiku, land art, lawn, oak tree, One-a-Week Photo Challenge, photo challenge, Ronovan's Haiku Challenge, spiral. Bookmark the permalink. Pingback: Aliens Loving Yoga #SillySaturday | Rhyme and No Reason! Pingback: Strictly #SillySaturday | Rhyme and No Reason! Pingback: #SillySaturday Cinderella | Rhyme and No Reason! Pingback: #Sillysaturday Maggie the Pole Dancer Raunchier Version | Rhyme and No Reason! Pingback: #Sillysaturday Mrs Moss and Lichen | Rhyme and No Reason! Pingback: #Sillysaturday Maggie and Shelma in Town | Rhyme and No Reason! Pingback: #Sillysaturday Shelma’s New Man | Rhyme and No Reason! What a novel idea – The Boys would love it if we ever did that! Have a go – it doesn’t take long to make and you can always mow it away after the boys have enjoyed running it. Not late at all – you have all week to enter. Such a nice photo too, makes me feel quite homesick. Ahh, thank you – hopefully not too homesick! More photos of our trip to follow during the week. Excellent! I’ll look forward to seeing them. Well if I were mad (and who’s to say I am not already), I wish I were that creative! Sandra, here is the link to my TURN, the full haiku will now be evident. A great creative entry this week Denis, thank you. Beautiful images Sandra, what a great addition to the garden . Thank you Denis – the spiral is fun for the children and a puzzle to my neighbours! Wow that looks so amazing. Love the light in the photo too. Thank you MM. I was glad to catch the light in that moment. P.S. Time for a flight of fancy. What if the spiral were magic and running around it actually took a child somewhere else? Absolutely fabulous! Yes! Laurie – go for it!!! I do love our little riffs! Oh, nice! The spiral is my favorite shape. Wonderful to have it on your lawn where kids can run around it and a tree becomes a sundial. Yes, spirals occur in so many places don’t they. What a cool idea! And you can change it without much headache, too! Yes indeed Kathy, an easily altered piece of land art. I LOVE your spiral! What is it about that shape that is so compelling? And the photos of the children running captures the mood perfectly. I think I’d like to be a graphic designer in a future life–that design is so excellent! I did consider doing a Graphic Design Course once upon a time, but I think my mind is too chaotic to come up with such neat designs – love them though. I love that you have your future life planned! me too – several! Wonderful, very similiar to the one in the Quaker Community Garden I wrote about in one of my 30 day wild posts. Have to be done barefoot. Oh yes! Barefoot is great. A great way to start the day. Oh! how wonderful Lisa. How lovely to have the spiral out front. I don’t know of anyone else with one in their garden. Touching response from the salesman. I often create one on a sandy beach for the children to run round as well and we often have interesting conversations with passers by. Thank you so much for the link – it looks magnificent! One of the Dan Brown books is full of designs like you ‘turn’. And there I was thinking you had designed it your self! Like the spiral but I don’t have a lawn. Did do this on my old paving though in chalk. https://rainbowjunkiecorner.files.wordpress.com/2016/03/0448-paving-on-right-side.jpg More a maze than a spiral! 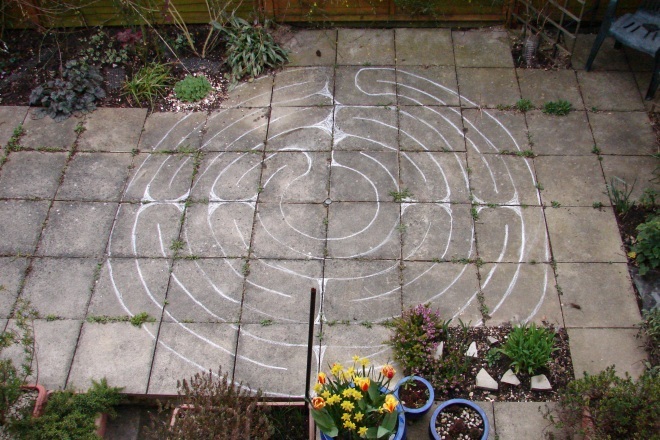 Ah yes a labyrinth – I love making those as well – although not with the lawnmower. I do like your chalk one – fun to make.